Wendy Corsi Staub is back with the second in her newest series located in Mundy’s Landing. With the release of her book, she is on a book tour this month, hosted by Partners In Crime Virtual Book Tours. The bestselling author can be found at a number of sites during the tour. We hope you will enjoy our review and drop to several sites to find more reviews, guest articles and interviews with this very popular author. You will find a link to the full schedule below. 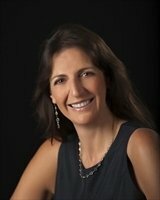 Author Wendy Corsi Staub is a master of tension building. She has also mastered involving a reader in the lives of the characters she writes. Page by page, you grow more connected to each, mostly good, some very bad. Chapter by chapter, you grow more on edge as you anticipate the killer’s next step. 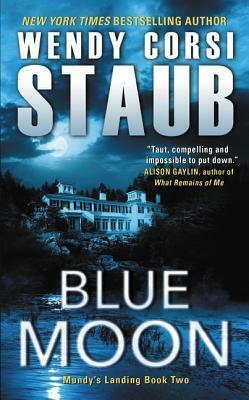 Blue Moon reflects both in a well written, suspenseful mystery. In the second entry to the Mundy’s Landing series, the small town is getting ready for an annual celebration designed to bring in tourists. Called the Mundypalo0za, it’s an odd sort of event, capitalizing on an unforgettable point of history in Mundy’s Landing. That event was a series of unsolved murders that occurred a one hundred ago. This year is the centennial of that event. With a hefty reward offered to the one who solves the century old murders, tourists can be found everywhere, especially at the museum and sneaking around the three murder houses. One of them has far more than prize money on his mind. He plans to recreate the murders. Annabelle Bingham and her family have recently purchased one of the murder houses, moving into the ‘fixer upper.’ Stressful enough without all the people milling about. Then Annabelle begins to feel that someone is watching her. Enter vacationing Detective Sullivan (Sully) Leary, from the NYPD Missing Persons Squad along with her partner, Stockton Barnes. While outsiders, the fresh eyes they offer to the cold case that could help the current one as well. Hopefully their presence means we will see them in future books. Clues are dropped along the way, but the mystery remained for me until the nail-biting finale. A long-cold case, a frightening killer stalking the little town, and well developed characters are woven together into a fascinating thriller. It will surely make you think twice about buying a murder house of your own. I admit I would have liked one more chapter to see a few pieces resolved. The story did have a solid resolution, so perhaps the next in the series will reveal those last little details. I hope to see more of Annabelle, Trip and Oliver as well as Sully and Barnes. You can see why Ms. Staub is a best selling author. With more than eighty successful novels published, you will find a vast selection when you are ready to read more. This is her newest series, beginning with Blood Red, published in September of 2015. If you prefer to read a series in order, you may want to start with that one, though Blue Moon is definitely a stand alone. Either way, you will enjoy Wendy Corsi Staub’s works! Hair neatly braided, hands serenely clasped, eyes closed, the young woman appeared to be sound asleep. But the peaceful tableau was a madman’s handiwork. Beneath the covers, her white nightgown was spattered with blood. At daybreak, a horrified family would discover her corpse tucked into their guest room. The cunning killer would strike again . . . and again . . . before vanishing into the mists of time. A century ago, the Sleeping Beauty Murders terrified picturesque Mundy’s Landing. The victims, like the killer, were never identified. Now, on the hundredth anniversary, the Historical Society’s annual “Mundypalooza” offers a hefty reward for solving the notorious case. USA Today and New York Times bestseller Wendy Corsi Staub is the award-winning author of more than seventy novels and has twice been nominated for the Mary Higgins Clark Award. She lives in the New York City suburbs with her husband and their two children. I agree, this book was a nail biter!